If you saw spears flying above the UO's riverfront fields late winter quarter, you weren't lost in a dream. Students in an introductory anthropology course were seeing whose hand-built atlatl could fly the farthest — and perhaps hit a target. Atlatls are tools featuring short darts socketed into shafts. They emerged independently more than 17,000 years ago among several cultures around the world for hunting or use as weapons. The invention pointed the way to bows and arrows. Making an atlatl and learning how to throw it opens a window for budding anthropologists or archaeologists to understand the past, says Scott Fitzpatrick, associate professor of anthropology and director of the department's undergraduate studies. More importantly, he added, such an exercise adds fun to his Anthropology 145 course "Principles of Archaeology" that offers a strong foundation on the research methodology used by archaeologists to discover and understand the artifacts they find at sites around the world. 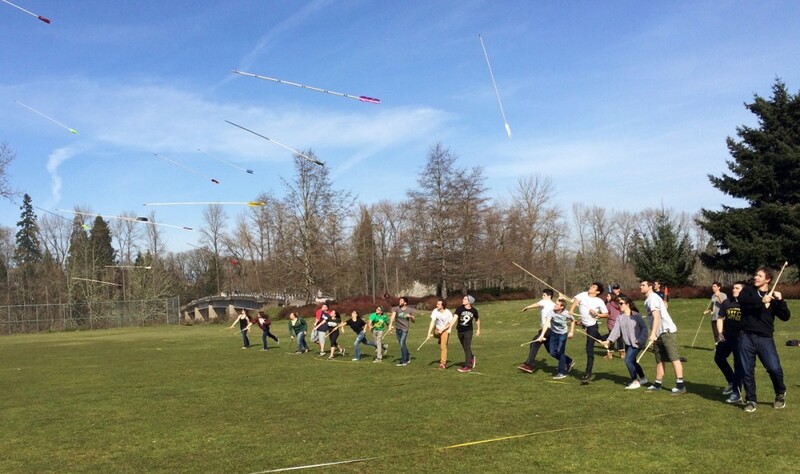 "The atlatl exercise was probably my favorite exercise of the term," said sophomore Josie Greer, a journalism major from Clackamas. "We were able to simulate what people used in the past to hunt and survive. I liked how we got a taste of what experimental archaeologists do. We were also able to gain perspective how to make and use this specific composite tool. I was actually surprised how far it could go." 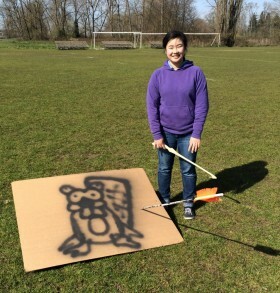 Greer also was the only female student to accurately hurl her atlatl and hit a target 40 meters (131 feet) away. The course is a spinoff of Anthropology 150, the department's long-running introductory course, which Fitzpatrick taught as a graduate teaching fellow en route to his doctorate from the UO in 2003. "When I returned in 2012 to join the department, my colleagues and I felt that students were not getting good exposure to core principles," he said. "So we split the course, with 145 being a methods-focused class with as many hands-on activities as we could incorporate." The course is open to nonmajors seeking to fulfill general science requirements. Students explore mapping, interpret and date materials found in layers, create Nazca lines and answer questions based on sample data from a hypothetical ancient settlement in the American Southwest. Nazca lines are geoglyphs, or patterns, based on such things as animals and humans that were made in Peru's Nazca desert 1,500 years ago. Students used strings and flags to created them. "The course contained a lot of interesting history and information about how archaeology around the world actually works," said sophomore Josie Christensen of Portland, who is studying biological anthropology and art. "I enjoyed the time I spent learning this information." Early on in the course, Fitzpatrick takes time to put archaeology into perspective by comparing the entertainment industry's portrayal with real life. "This adventurous image, such Indiana Jones, is what most people think of when they think of an archaeologist, but this is not the case," Greer said. "We learned there is a lot more work than just excavating artifacts. Some of the general tasks archaeologists that do are research, plan, finance, excavate and then contribute their work. This class as a whole let me separate the work I thought archaeologists did from what they actually do."